In 2004, New York photographer Richard Rothman traveled west with a 4 x 5 camera to explore the remaining fragments of ancient old-growth forests in Northern California. Unexpectedly, he developed an interest in the neighboring town of Crescent City. Rothman was affected by the town's disposable architecture, its emotional tenor, its political and religious culture, and the relationship that the townspeople had with the corralled forest to the east, and the Pacific Ocean to the west. 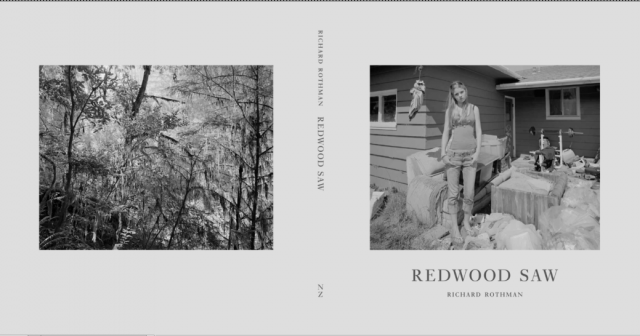 The body of work, made over a five-year period, is gathered together in Rothman's first book, Redwood Saw, and combines photographs of the spectacularly ornate forest environment with the disposable landscape of the town and portraits of Cresecent City residents. "For me," Rothman says, "the subject of Redwood Saw transceneded the specifics of the town of Crescent City. I saw it as a local story, fascinating in all its specificity, but also a global story. That is one of the essential tasks of photography: to recognize those salient facts which can become a vehicle for metaphor." Rothman's exploration of the themes of longing and unhappiness, reflected in the faces and bodies of the townspeople, suggest our underlying and universal human predicament.